January 20, 2009 was a great moment in American History when Barack Obama was sworn into office as the first African-American President of the United States of America. If only Martin Luther King, Jr. was alive to see this momentous moment in person. 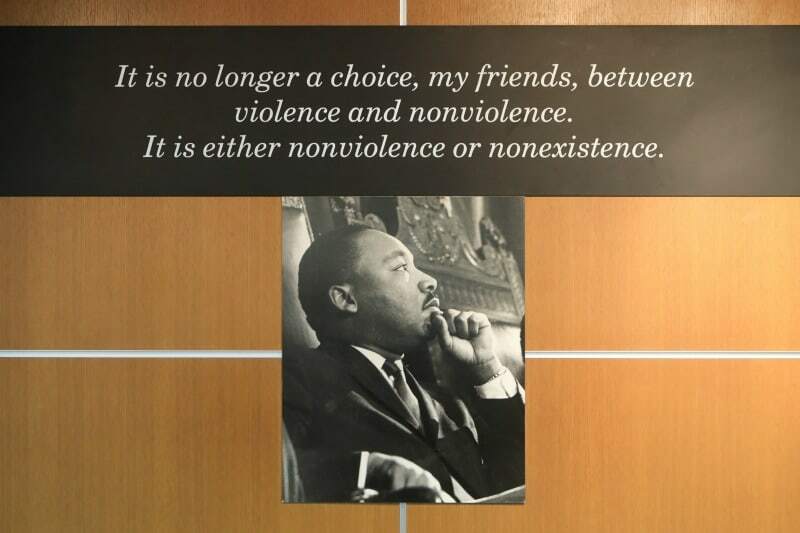 When you are ever in Atlanta on vacation or business, take the time to visit the Martin Luther King, Jr. Center right in the middle of Downtown Atlanta, Georgia. 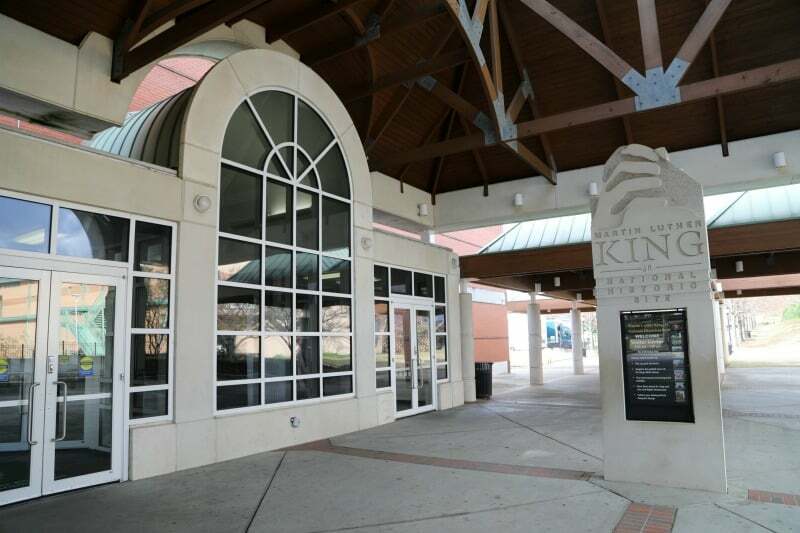 Since 1980, the MLK Center has been a National Historic Site that is preserved for future generations to learn about the life and works of this fascinating man. 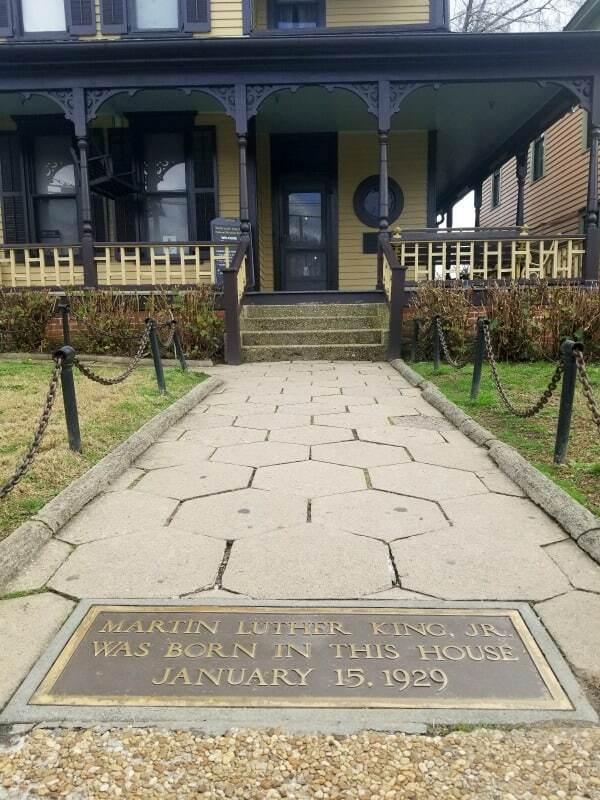 In 2018 the Martin Luther King Jr. National Historic Site was changed to a Historical Park. This re-designation allows the park service to oversee additional buildings and areas as part of the site. This is a great expansion and re-designation that will hopefully allow the National Park Service to tell even more of Martin Luther King Jr.’s story. Once you get out of the car in the enormous parking lot leading to the center, your trip begins on The International Civil Rights Walk of Fame, a path of plaques and footprints created by Civil Rights activist and artist Xernora Clayton in honor of the African-American pioneers and their supporters who were instrumental in following and continuing the peaceful path for African-American and African equality around the world. 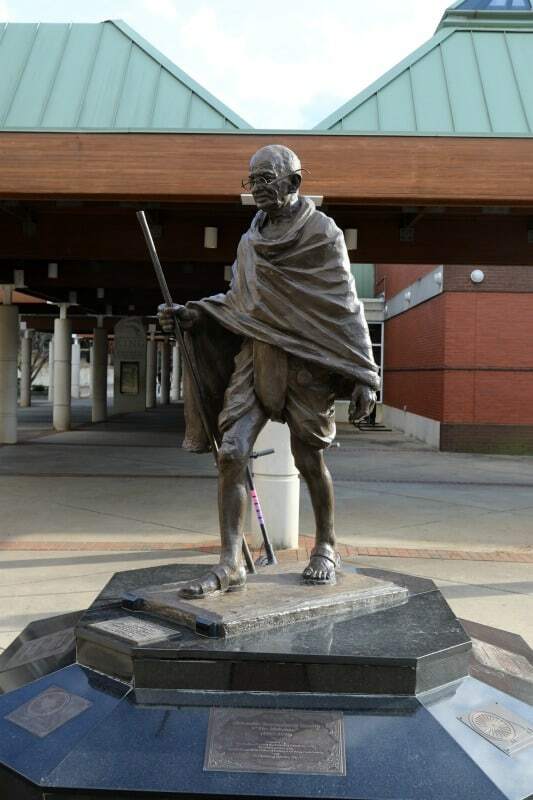 The Walk of Fame leads to Gandhi Promenade and a statue of the Indian peace leader who Martin Luther King considered a hero and modeled his peaceful search for African-American Civil Rights similarly to Gandhi’s peaceful search for India’s independence from Great Britain in the mid-20th Century. 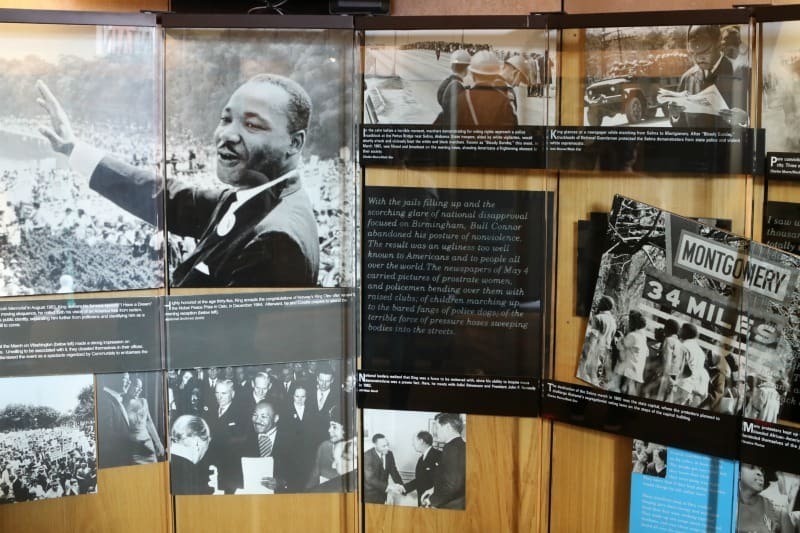 After checking out the International Civil Rights Walk of Fame, you enter the Martin Luther King, Jr. Center itself and are greeted by several posters of Dr. King before entering the museum itself. You will not be disappointed in the center and learning about the fascinating Dr. King and his struggle for Human Rights and African-American equality. 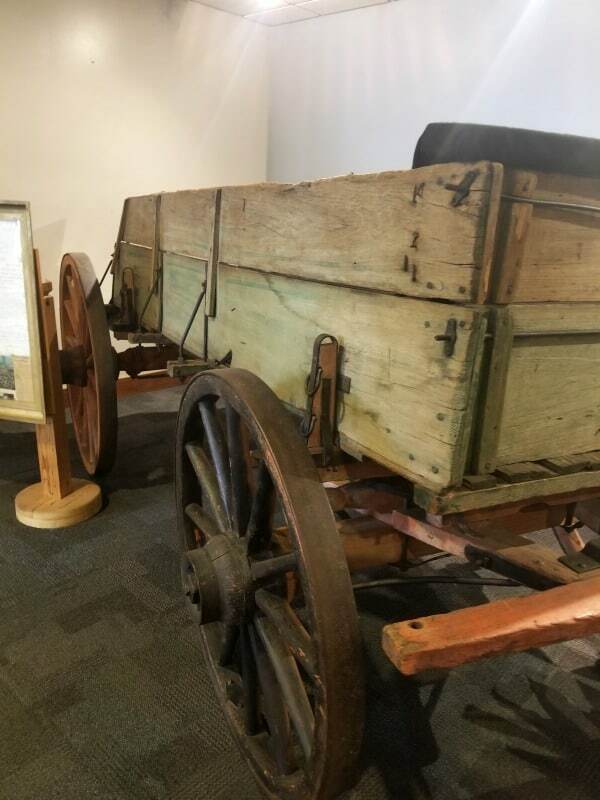 The photos and memorabilia from the several exhibits will hit you like a line drive with the emotional tales of lynchings of African-Americans in the South. For over 3 Centuries in the American South, an African-American could not even say “Hi” to a white woman without the fear of facing arrest or physical harm from a white mob and the police. One African-American man found this out the hard way in the 1950s when he was visiting family in the South from Chicago and called a white woman “Babe!” After his arrest, he was dragged from his jail cell with the police’s blessing and lynched by a mob. 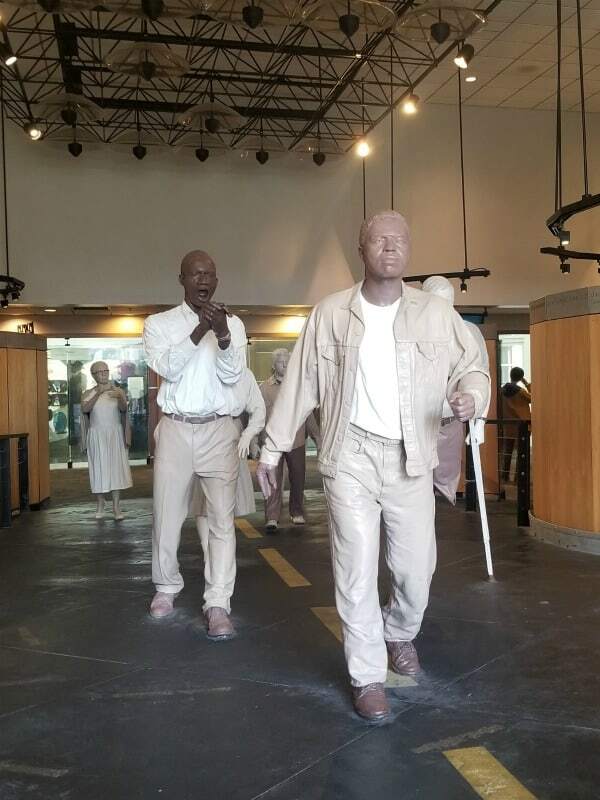 One of the most moving parts of the Martin Luther King, Jr. Center are the statues of people of all races, creeds, and religions marching across “The Bridge to Freedom and Equality.” You can march or walk among this interactive exhibit and experience the march for yourself. Throughout the Center, Martin Luther King, Jr’s lifetime of speeches and sermons are played for all to hear, and the exhibit climaxes with a stirring and tear-jerking exhibit from his April 3, 1968 speech to the Memphis sanitation workers. “I’ve Been to the Mountaintop” is one of the most prophetic and emotional speeches in modern American History, and the photos from that night and Dr. King’s assassination at the Lorraine Hotel the following day can put one into an emotional tailspin. 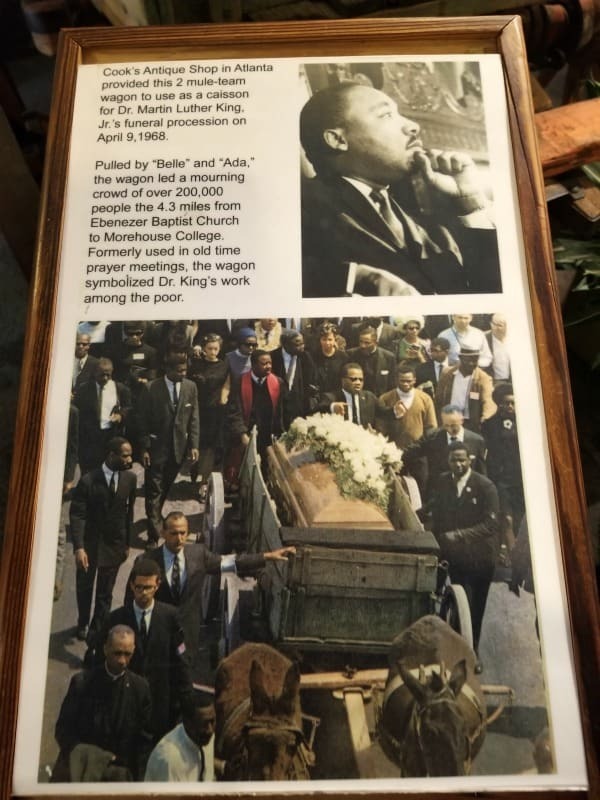 Dr. King’s simple casket from his April 1968 funeral service is on display in a separate room from the gallery and is well worth a few minutes of your time to reflect on this man’s life and untimely death. Photos are allowed in the museum itself but not in the casket gallery, but the sight of the casket and hearing Dr. King’s speeches will be engraved into your memory for a lifetime. After leaving the Martin Luther King, Jr. Center the back entrance, you are greeted by the New Ebenezer Baptist Church on the Center grounds and a moving statue called BEHOLD! Based on Kunta Kinte, Alex Haley’s ancestor made famous in his book “Roots”, this statue of Kunta Kinte raising his infant daughter to the stars is a testament to the centuries-old struggle for equality and freedom for all people. The back of Martin Luther King, Jr. Center goes out to Auburn Avenue and the old Ebenezer Baptist Church. You can explore the rectory and exterior of the church that Martin Luther King’s father and grandfather preached at and where Martin, Jr. was baptized and started his career in the ministry before moving to Alabama in the 1950s. 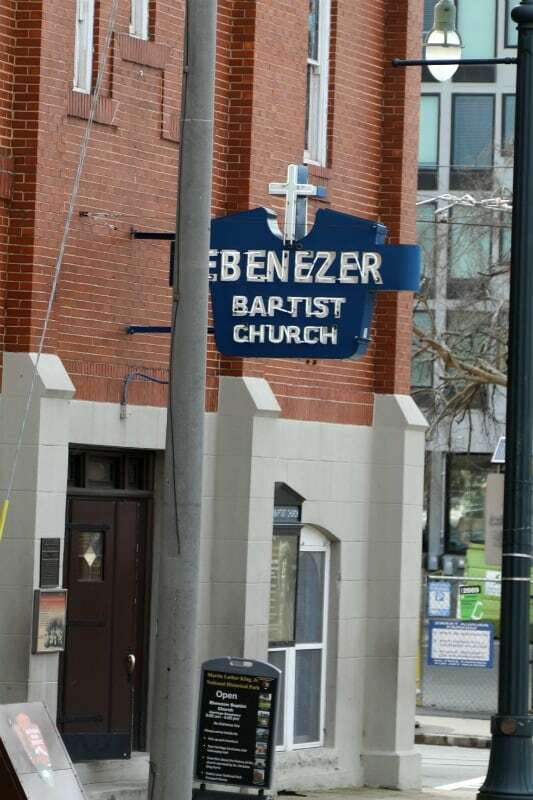 The New Ebenezer Baptist Church is also open to the public and was the site of Martin’s mother’s tragic shooting in 1971 as she played the piano during a Sunday church service. Walk further down Auburn Avenue and see Martin Luther King’s grave afloat a reflecting pool and take a moment to pray and remember this man’s life to better others. 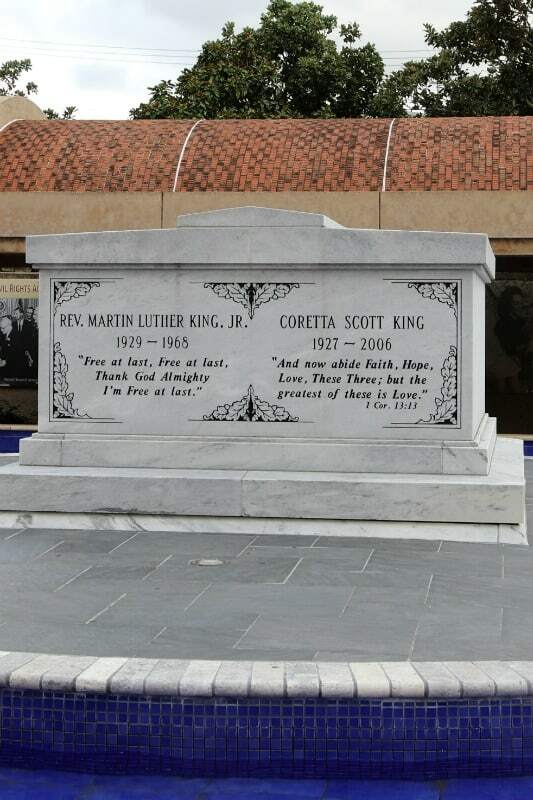 Coretta Scott King was buried next to her husband after her passing in 2006, and both names are engraved on this simple grave in a sea of humanity. After seeing Martin Luther King, Jr’s final resting place, walk further down Auburn Avenue to his birthplace on 205 Auburn. Martin was born in this 1895 Victorian home and lived here for the first 12 years of his life. 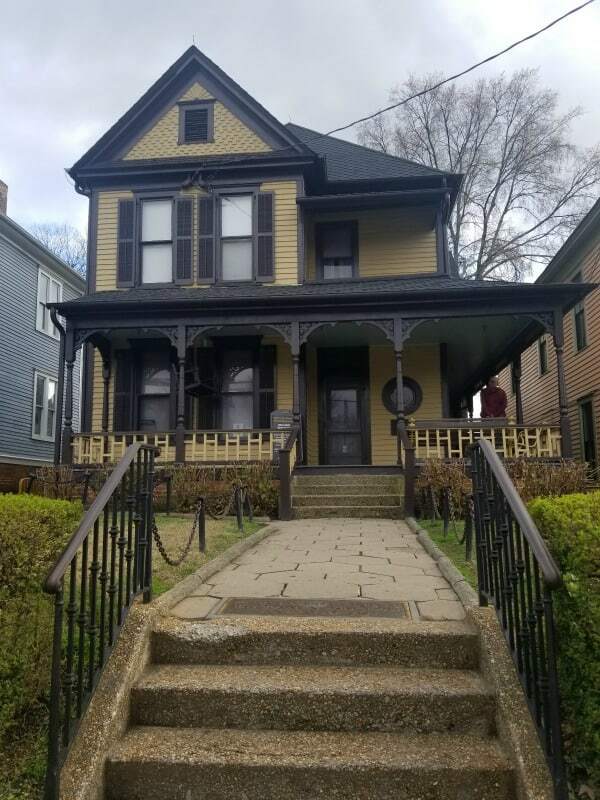 The house is tourable with a guided tour only, and the entire neighborhood has been restored to its original beauty and per Dr. King’s wishes, the homes are home to low-income families and other residents of Atlanta. Across the street from Dr. King’s Birthplace is a row of shotgun homes that were home to African-American laborers in the early 20th Century and was the site of several riots against the police who were sent there to break up strike meetings that occurred in the houses. The shotgun houses are now liveable apartments for today’s generation to live in. The Martin Luther King, Jr. Center and other sites on Auburn Avenue are open daily from 9-5 and are free of charge to tour. 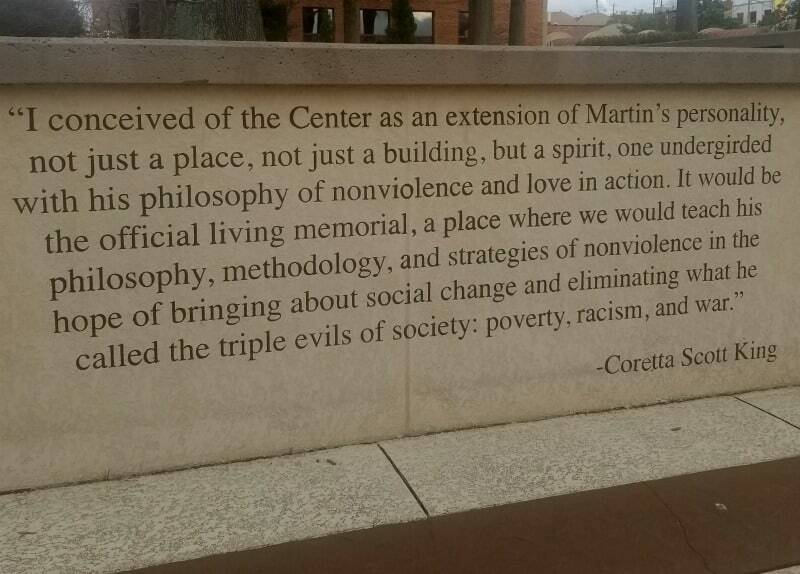 It is well worth a half-day to tour this wonderful historical monument to one of America’s pioneers of peace and equality. Birth Home Tour – If you plan to see the Birth Home you will need to sign up for the ranger-led Birth Home Tour at the visitor center. The first tour at 10:00 am and the last tour at 4:00 p.m. Tours are limited to 15 people. The tours are filled on a first-come, first-served basis on the day of the tour. No advanced registration or phone reservations are accepted. Be prepared to wait several hours for the next available tour. 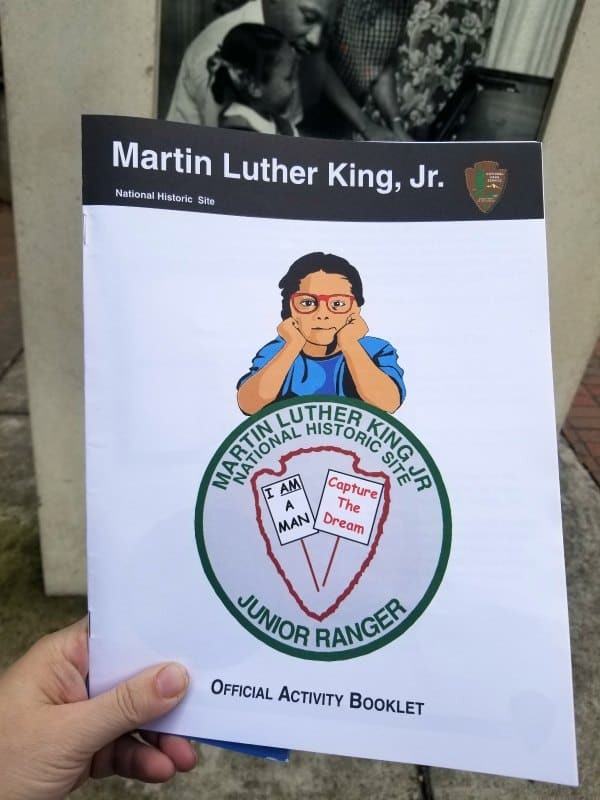 The junior ranger program can be completed while visiting the visitor center. Depending on the age of the participant depends on how many activities need to be completed. Activities range from a word search to a coloring sheet and connect the dots. The junior ranger program is a great way to learn more about the park during your visit. As you walk from the Visitor Center towards the birthplace home you will pass Fire Station No. 6. Martin Luther King Jr and his friends would play basketball behind the fire station and watch the fire trucks. Leave during the 1930s and 1940s MLK and his friends would not have been allowed to be firefighters due to their skin color. The movement that MLK led in the 1950s and 1960s helped to pave the way for integration in fire stations including Fire Station No. 6. Fire Station No. 6 is staffed by volunteers when possible. 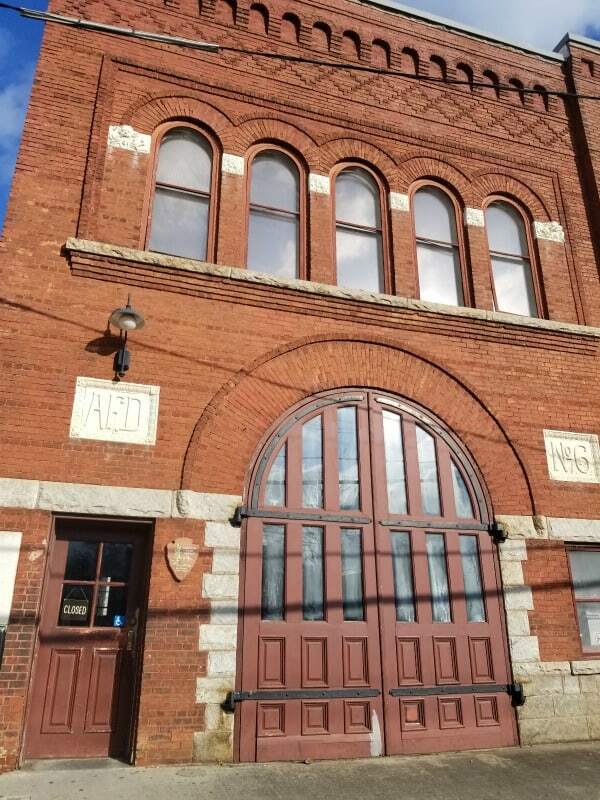 If there are volunteers on site you can go into the firehouse and see a 1927 American LaFrance fire engine and learn more about the civil rights movement led to the 1963 desegregation of the Atlanta Fire Department. Martin Luther King Jr. was baptized at the Ebenezer Baptist Church as a child. The church is located across the street from the visitor center and near the King Center. Ebenezer Baptist Church is where his funeral was held amidst worldwide coverage in 1968. There is a large parking lot across the street from the visitor center. We ended up driving around the block a few times to find the entrance to the parking lot. 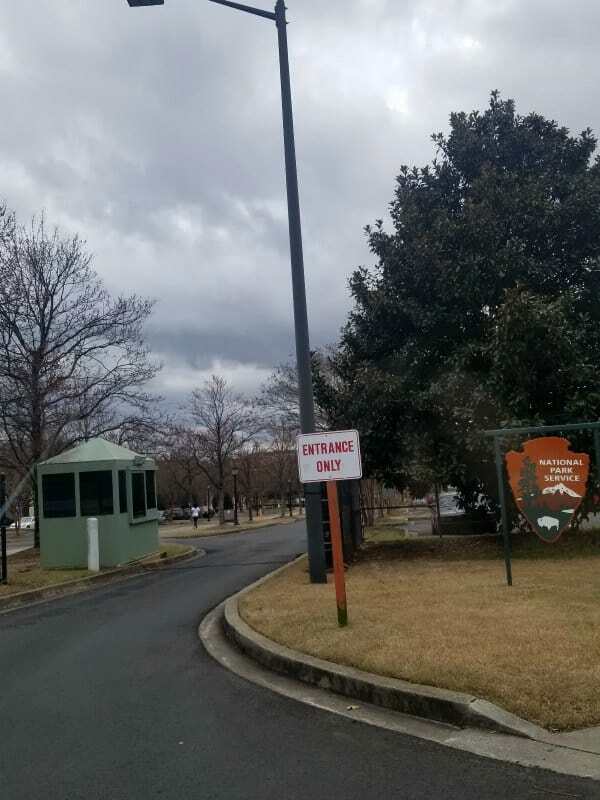 If you do not have a GPS with you drive around the block until you see the entrance to the parking lot at the farthest side from the visitor center. The park’s parking lot is located on John Wesley Dobbs Avenue. MARTA you can take bus Route 3 (Martin Luther King Dr./Auburn Ave.) or Route 99 (Boulevard/Monroe Dr.). Find information and schedules here. The Streetcar’s current route connects the Martin Luther King Jr. National Historic Site to the east and the Centennial Olympic Park area to the west, with 10 other stops in between. Plan your trip or call 404-848-5000 for help and the latest schedule updates. Park Entrance Fee: $0.00 there is no charge to visit Martin Luther King Jr. National Historical Park in Atlanta. 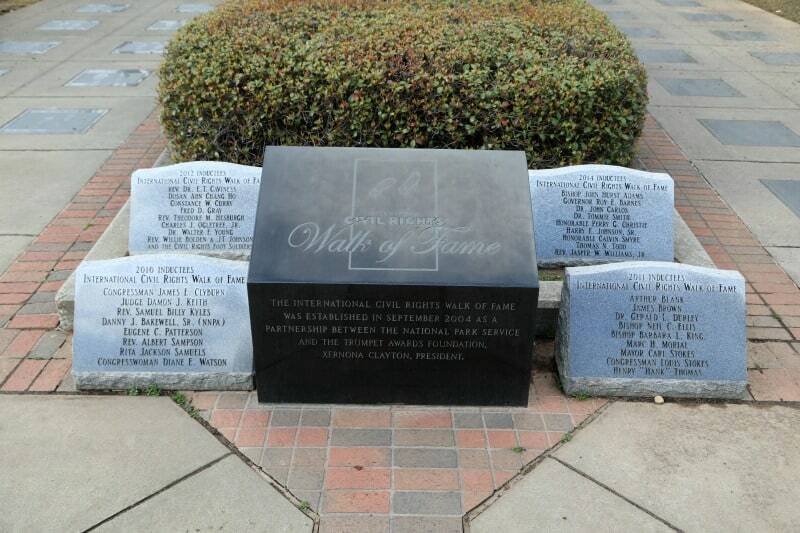 The Visitor Center, Historic Ebenezer Baptist Church, and Freedom Hall are open from 9 a.m. to 5 p.m. daily. The Birth Home is open for ranger-led tours from 10 a.m. to 4 p.m. daily. Fire Station No. 6 is staffed by park volunteers and is open from 9 a.m. to 5 p.m. when volunteers are available. All facilities are closed January 1st., Thanksgiving Day, and December 25th. Pets: Pets are welcome but there are some restrictions. Pets must be on a 6′ or shorter leash at all times. Pets are not allowed in the following structures except for certified service animals trained to assist persons with disabilities or to guide dogs accompanying visually impaired persons. Check out all of the National Parks in Georgia and nearby Alabama National Parks.